Perhentian means "place to stop" in Bahasa Malay, the language of Malaysia; the Perhentian Islands' crystalline blue water teeming with aquatic life will make you want to do exactly that. 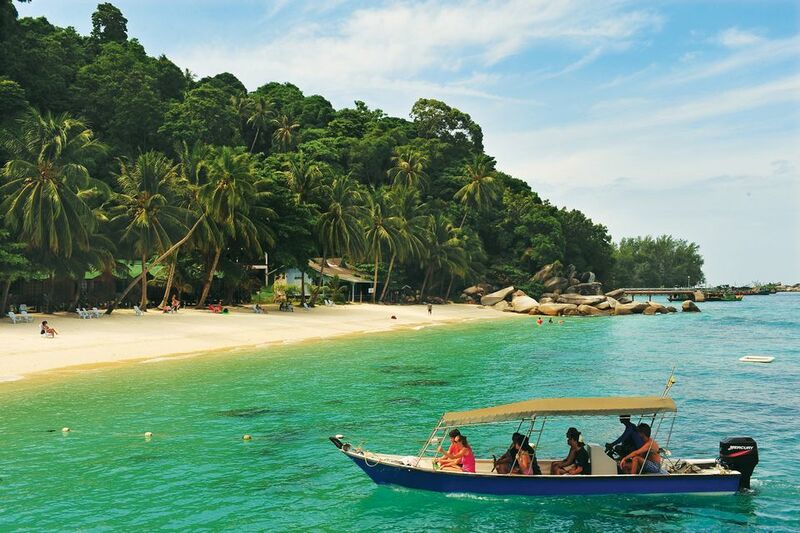 Easily accessible from the northeast coast, the Perhentian Islands are Malaysia's crown jewel of islands. Cheap scuba diving, picturesque beaches, and the chilled vibe of island life cause people to leave their hearts buried in the white sand once they leave. Two islands make up the inhabited part of Pulau Perhentian, both with their own distinct personalities and devotees. Perhentian Kecil - the small island - tends to attract backpackers, budget travelers, and younger crowds while the larger Perhentian Besar draws in a more mature, resort-oriented crowd. Although tourism is the lifeblood of Pulau Perhentian, the islands have not lost their rough-and-tumble, jungle appeal. There are no structures over two stories tall, no motorized vehicles, and electricity is provided by temperamental generators which could leave you in the dark with no notice. Very little infrastructure exists on the islands; there are no real "sites" or activities outside of enjoying the sun and water. Internet access is spotty and expensive; internet cafes charge US $5 an hour or more. Large monitor lizards can sometimes be spotted roaming the island; don't be concerned, these are not Komodo Dragons such as those on Rinca Island! Warning: There are no banks or ATMs on the islands; thieves target guest houses on Perhentian Kecil because they know that travelers must bring enough cash to the islands. Perhentian Islands resorts. Accommodations on the Perhentian Islands tend towards the budget to the mid-range, with the Perhentian Island Resort taking up the high end of the scale. Survey your options online. Perhentian Kecil is the rowdier and busier of the two Perhentian Islands. Popular with backpackers from all over the world, the small island quickly fills up during busy season; it is not unusual to find people sleeping on the beach waiting for accommodation! Perhentian Kecil is divided into two very distinct beaches: Long Beach and Coral Bay. Long Beach is the primary destination on the island with nicer beaches, more nightlife, and more accommodation. Coral Bay is significantly more relaxed and offers slightly lower prices for accommodation and food. Coral Bay is the place to be for glorious sunsets, but most travelers walk back to Long Beach for socializing after. The two beaches are connected by a jungle footpath that can be walked in 15 minutes. Also called "the big island", Perhentian Besar appeals more to families, couples, and a slightly higher-budget crowd. The island is far quieter and more relaxed than Perhentian Kecil. Luxury bungalow operations resembling small resorts have set up on Perhentian Besar and, unlike their counterparts on the small island, include private bathrooms and air conditioning. There are three main beach areas on Perhentian Besar, with Teluk Dalam claiming the most secluded stretch of clean, white sand. A rocky stretch of sand known as "Love Beach" is pretty much the gathering place for people looking to socialize. Pulau Perhentian is part of a protected marine park; the diving is superb and very inexpensive. Thanks to a turtle restoration program, sea turtles, as well as sharks, are numerous. A host of dive shops on both islands provide PADI courses and fun dives, starting at US $25 per dive. Visibility is usually around 20 meters during the dry season. Snorkel gear can be rented from guest houses and beach shacks for around $3 US a day. Boat trips are available or you can simply walk out into the water. Perhentian Kecil: The best snorkeling is found on the Coral Bay side of the island. A small path to the right of the pier passes over rocks and through several isolated coves with great snorkeling just a few meters offshore. Perhentian Besar: The north and east sides of the island offer the best snorkeling without the aid of a boat. Pulau Perhentian is best accessed via the small town of Kuala Besut. Two daily buses make the nine-hour journey between Kuala Lumpur and Kuala Besut. There is no direct bus service coming from Kota Bharu, you must change to a local bus in either Jerteh or Pasir Puteh. The speedboats between Kuala Besut and the Perhentian Islands are a spine-adjusting, hair-raising experience. When the sea is rough, the boats bounce off waves sending bags and passengers into the air; be prepared to potentially get your belongings wet. The larger speedboats stop just short of shore and make a precarious transfer of luggage and passengers into smaller, wooden boats that run onto the beach. For Perhentian Kecil, the boatmen will demand $1 US - not included in your original ticket. Expect to jump overboard with your bags into knee-deep water to wade ashore. The best time to visit the Perhentian Islands is during the dry season from March to November. The islands are practically empty and many businesses are closed during the rainy months. July is peak season; book accommodation in advance. What Should I Know Before I Visit Malaysia's Perhentian Islands? Diving in the Perhentian Islands is Fun and Cheap!